Imagine that you are an international student in Japan. The school that you are going to is based on Christian beliefs. Students are required to take a class about Christianity in their first year, and also to go to sermons a couple of times a term. As the first term goes by, you adjust to life in Japan, making friends that you are comfortable with. Summer comes, and a friend invites you to a matsuri, a festival, near their home and also have a sleepover afterwards. It sounds like fun, and you accept. For the first time in your life you enter a Japanese family’s home. You are led into the living room, and your friend’s family greets you. You look around the room, and a black box like object in the corner catches your eye. Noticing this, your friend leads you closer, and explains it is a butsudan, a Buddhist altar, and asks if you would like to light a senko incense and pay your respects to the family’s ancestors. You do as asked, following your friend step by step, peeking through the sides of your eyes while your friend puts together their hands and prays. As you stand up, another thing catches your eye, there is a decorated shelf near the ceiling. Your friend notices this too, and explains that it is a kamidana (literally translated “god shelf”) a place for a Shinto god in the home. Again, you mimic your friend and pray towards the kamidana. 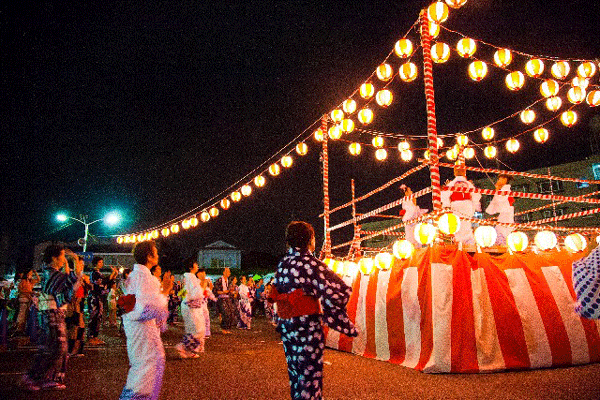 Your friend lends you a yukata, a traditional summer robe, and together you head to the matsuri. It is being held at a nearby shrine, and there are people everywhere. Through the crowd, a group of people carrying a large decorated box like object on their shoulders comes through. Your friend explains that it is called a mikoshi, and that they are carrying god inside. You ask what god is on there, but your friend does not know. Apparently, the whole matsuri itself is for some kind of god, but your friend does not seem to know or really care. You enjoy the rest of the night eating street food and playing games. Back at your friend’s home, you prepare for sleep. The friend’s family has put out an extra set of futon mattresses for you. As you spread the futon and place the pillow to one side, your friend mentions that that side is the north. Apparently, it is a bad luck to sleep with the head towards the north, because that is how dead people are laid. You move your pillow to the other side and go to sleep. Towards the end of the summer, your friend invites you again. This time, there is going to be a traditional dance event. The dance is held on the field of a nearby elementary school. People are dancing in a circle around a raised stage, where a few people play Japanese drums and flute. Anyone can join in the circle. The choreography is simple, a couple moves repeated endlessly. After a few tries, you are comfortable dancing in the circle. On your way back, your friend explains that it was a bon-odori, a dance event held towards the end of the bon season for the dead spirits. Japanese spirituality is complicated. While this is an imaginary story, this is not too far fetched from the reality. It is said that Japanese people nowadays get baptized at a Shinto shrine, marry in a Christian church, and have their funeral at a Buddhist temple. Many Japanese people would say that they do not really have a faith, and yet be involved in multiple religious groups. Their daily life is filled with evidences of spirituality, from a good luck charm on a bag to actively participating in events organized by the religious groups. It is definitely not the case that Japanese people are secular and ignorant of beliefs, but the concept of religion has developed in a very unique way in Japan. This has mainly do to Shintoism, which most Japanese people unconsciously identify with. You may ask, “how can anyone ‘unconsciously’ identify with a something?”. It is because Shinto beliefs are so deeply ingrained into daily life, that people do not realize that what they are doing are part of the Shinto belief. For example, why do Japanese people commonly refer to the sun and the moon with a “sama”, a respectful suffix on the end? Shintoism is a belief that is thought to have emerged through folk faiths and the worship towards nature. It worships “八百万の神” (yaoyorozu no kami), meaning countless numbers of kami, gods or spirits. Kami exists in everything and everywhere of nature, from a seedling to an ancient tree, from the bathroom to the living room, from the ocean to the sun. Dead human spirits can become worshipped as kami too. Around the country, sacred places were marked, and these later became shrines. In a way, Shintoism is not a religion. It doesn’t explain how the world was created, nor does it explain the meaning of life. It doesn’t give you rules to follow, or produce miracles in times of need. There are no texts or teachers. In other words, it doesn’t really do anything. It was there when people realized, and named “Shinto” just in order to distinguish it when Buddhism was introduced to Japan. Yet, Shinto is very much a religion. People visit Shrines and pray, they buy good luck charms and treasure them. They even invite god into their homes. Festivals are held everywhere to honor the gods almost every day of the year, and offerings are made. People believe in something, something beyond humans that protect them, and must be protected. Multiple religions and sects coexist in Japan, most prominently Buddhism and Shintoism. It may seem contradicting that several distinct religions coexist, but that is possible through the Japanese interpretation. Faith is something very personal, and it would be impossible to put down a finger and say that this is Japanese spirituality. Each person has their own interpretation of kami-gami (plural of kami), and their own relationship with them. While people may agree or disagree with the contents of this article, hopefully it has given you an insight to this complicated notion. 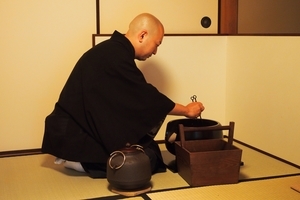 Intimate, restorative and relaxing, the ancient practice of zazen provides its practitioners with a unique, peaceful respite from the demands of daily life.